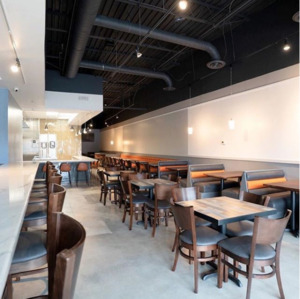 ATLANTA, GA, January 11, 2019 — Bryan Davis, vice president of retail services for Ackerman & Co.'s Retail division, represented Gocha Hawkins in leasing space for her new fast-casual restaurant-concept, Gocha's Breakfast Bar. Gocha, salon owner and award-winning hairstylist to a number of TV and music personalities including famed Real Housewives of Atlanta, has signed a 5-year, 2,000-square-foot lease at the Cascade Crossing Shopping Center in South Atlanta. The restaurant opened its doors earlier this month, for both breakfast and lunch, and hosted its official open house on Thursday. Gocha's Breakfast Bar specializes in updated classics such as chicken & waffle sticks, country biscuit sliders and introduces new food items such as pork belly skewers. In additional to a full bar lineup, signature drinks include cinnamon toast crunch shots and breakfast margaritas.